Please note that this is NOT the full report, but the Executive Summary with Kyrgyzstan and Tajikistan Case Studies. The full report will be ready in 2 weeks, stay tuned for the updates! There are 44 landlocked countries in the world, of which 32 are classified as middle- or low-income by the United Nations. These 32 comprise the Landlocked Developing Countries (LLDCs). They can be grouped into seven distinct regions, each with unique challenges. Nine LLDCs were selected for closer analysis as part of this report. The key factor that sets LLDCs apart from other countries is access to the sea and the consequent trade obstacles that presents in respect to transport and transaction costs. In 2014, the average cost to export one container from an LLDC was US$ 3,444 and US$ 4,344 to import. Comparatively, transit countries faced much lower average costs of US$ 1,301 to export and US$ 1,559 to import. Rather than describe generic issues related to enhancing Internet access applicable to many developing nations, this report focuses on how the Internet can help the specific condition of being landlocked. There are three key areas where the Internet can assist physically landlocked nations become digitally land linked. First, networked customs systems have a significant impact on reducing the delays and cost of trading across borders. Second, just as LLDCs need access to the sea for goods trade, they also need it for access to fiber optic submarine cables. Third, LLDCs are on a more equivalent footing with non-landlocked countries in services trade. Here the Internet can provide a platform for the offshoring of information technology services. Despite near universal application of automated customs systems by LLDCs, there are a number of limitations. Real world problems have sometimes intervened, such as inefficient backend processes, poor project implementation, or disagreements between government agencies. Electronic communications to border posts has been imperfect. Another challenge is that customs software needs to continually upgraded and actively managed not only to take advantage of changes in hardware and software but also to reflect the widening trade community. LLDCs need to implement automated single windows that provide access over the Internet to the entire universe of institutions and companies involved in trade with facilities for e-payments. Given that all LLDCs rely on transit countries, it is imperative that customs systems be linked through regional single windows using open protocols and international standards to minimize problems caused by proprietary systems. LLDCs need to leverage digital tools such as IoT, tracking systems and big data that make trade more efficient. For digitalization to have the biggest impact, LLDCs need to remedy analog shortcomings. This includes leveraging regional economic communities to move as close as possible to open borders and incorporating the entire trading community in the digitalization process to enhance trust and acceptance. Only then can LLDCs remove a major development defect caused by their being landlocked. National backbones are crucial for LLDCs in order to interconnect with the networks of sea facing nations for access to undersea fiber optic systems. Downstream local access is dependent on upstream backbone networks as well as traffic exchange arrangements in terms of quality and prices. If there is insufficient international bandwidth due to constraints with the backbone network, quality and pricing of Internet access will be high. LLDCs that can successfully deploy cost-effective national backbones that are interconnected with regional transmission networks and submarine cables and where there are open domestic traffic exchange mechanisms will reap gains through fast Internet and low prices for consumers. Transit infrastructure: In some instances there is no route to the sea via some neighbors because that country has not extended its backbone to the border. Take the D.R. Congo, which borders Rwanda to the west and has access to two submarine cables on the west coast of Africa. While Rwanda’s national backbone extends to the border with D.R. Congo, the opposite is not the case. Political relations with neighbors: Armenia does not have diplomatic relations with either its neighbor to the east, Azerbaijan or to the west, Turkey. As a result, it has north and south links via Georgia and Iran but no east to west route even though its national backbone goes to the borders of Azerbaijan and Turkey. Bhutan has had a closed border – and no network connectivity – to China for decades. Peace and stability within transit neighbors: Burkina Faso could not avail of submarine cables in southern neighbor Cote d’Ivoire for a number of years because of civil war in the latter nation. Administrative processes in transit: There are generally no regional regulations that would establish fair interconnection and termination arrangements between countries resulting in bilateral negotiations between transit operators and LLDC operators that can result in significantly high costs. While some economic communities have established free trade of goods and services, they have not done so for cross-border data flows. There are also concerns about transiting through neighboring countries that might filter or otherwise control Internet traffic. Microwave can be used for cross-border transmission and satellite completely negates the need for cross-border transit. However, these technologies cannot match the price and capacity of fiber optic. While the long run costs of fiber optic networks are cheaper, their construction cost is high. Civil works and rights of way are significant financial challenges. LLDCs have pursued several models for deploying national backbones. There are often overlaps between the models. One model is operator driven. Given the high cost of deploying fiber optic cable, if there is not agreement among operators, then there will likely be duplication of backbones as well as routes that only some or one operator covers. This generally results in a high level of microwave connections due to the cost of fiber. Operators with deep resources and high market share are likely to invest the most in fiber optic backbones. An added incentive would be if the operator is part of a group that has subsidiary operations in neighboring countries. An example is West Africa where Maroc Telecom has a string of geographically connected subsidiaries. It is present in Mauritania where connection to the ACE submarine cable has created the impetus to build out the national backbone to the east so that it can interconnect with LLDCs in Mali, Burkina Faso and Niger. Unless there are regulatory safeguards, operators dominant in the fiber backbone market might not lease to other operators or might do so at a price that is not cost-based. Another is a cooperative model where operators agree to share the cost of deploying fiber backbones. The Burundi Backbone System (BBS) is a partnership between different operators in the country to share a national backbone on an open access basis. BBS is a joint venture between the Government of Burundi and five ISPs. The project involved the creation of a 1,250 km fiber optic backbone connecting all 17 provinces and cross-border connections for access to the landing points of international submarine cables in Mombasa and Dar Es Salaam. A third model is government led either by itself or through a public private partnership (PPP). In Rwanda, the government built a national fiber optic backbone financed in part from the sale of the incumbent operator. It later created a PPP to manage the asset. Bhutan is another example; the government has deployed fiber on electricity transmission networks, and ISPs do not pay to use it (but have to light the fiber themselves). One advantage of the government or PPP model for cross-border connectivity is that arrangements tend to take place at an inter-government rather than inter-operator level and can result in lower transit prices. Wholesale provided through specialized companies is another model. For example, Liquid Telecom, a Pan-Africa telecommunication group, has one of the continent’s largest fiber backbones stretching from South Africa to Uganda. They also have capacity on five submarine cables. Their network connects LLDCs Botswana, Lesotho, Rwanda, Uganda, Zambia and Zimbabwe. The attraction of the wholesale model is that theoretically since the backbone providers are not involved in the retail market, they would provide the same cost-oriented price to any customer. Wholesalers may also have robust regional connectivity facilitating cost-effective and reliable routes to submarine cables. A regional approach involves an agreement among a group of countries to connect their networks and financing is generally available from other operators or development partners to finance the project. For example, in Lao PDR two regional projects enabled it to achieve connectivity to all its neighbors, a rarity for an LLDC. Cross‐border connectivity between Lao PDR and China, Vietnam and Thailand was deployed as part of the China‐Southeast Asia Cable (CSC) project, which launched in 2001. Connectivity was enhanced in 2009 through the Greater Mekong Subregion (GMS) Information Highway Project. The network was partly financed by the Export‐Import Bank of China. The GMS Information Highway Project includes cross‐border links between Lao PDR and Cambodia, China, Myanmar, Thailand, and Vietnam – all countries where government is involved in the telecommunications sector and therefore may have facilitated regional connections. It is often argued that LLDCs pay more for international connectivity because they incur transit costs for access to undersea fiber optic cables. However, this is not always the case due to a number of reasons. First, operator groups might leverage their presence in neighboring countries (e.g., Sonatel linking Mali from Senegal and hence building its Senegalese backbone to the Mali border). In these instances, the operator group usually internalizes transit prices and other operators that desire to use this link may find the prices are not cost-oriented. Second, the distance to undersea cables in some LLDCs is not far. This is relevant when transit is charged by distance. Third, transit costs may be influenced by a variety of factors such as bi-lateral government agreements and scale. The case of Rwanda illustrates that it is possible for landlocked nations to have cheaper international wholesale connectivity prices than sea facing countries. Several enabling factors led to low costs in Rwanda. First, the World Bank provided a grant for the Rwandan government to purchase bulk capacity in order to achieve scale and lower international bandwidth costs. Second, in 2012 a 10-year agreement was struck with the Tanzania Telecommunications Company Limited to procure international bandwidth at an attractive price. Third, the government owned the national fiber backbone allowing it to provide cost-based open access so that operators could cheaply get their traffic to border crossings. Although international Internet connectivity via satellite is often eclipsed by undersea fiber optic, satellite remains relevant because it provides LLDCs sovereign connectivity. For example, Laos in 2015 launched its first satellite. Satellite provides backup in case of cable disruption; a cut to the Georgian fiber optic backbone took down the Internet in Armenia for several hours, and Bhutan’s connectivity lacks redundancy because of a single point of failure outside its territory (the Indian town of Siliguri). Satellite is also important for parts of the country that are not within reach of fiber backbones. South Sudan was about to install fiber optic to the Kenyan Border as part of road construction project until civil war broke out. In the meantime, one of the leading ISPs uses the O3b low earth orbiting satellite network for international Internet connectivity for its WiMAX customers. O3b has low latency and higher bandwidth compared to earlier generations of satellites. Another LLDC using O3b is Chad where the satellite provides international bandwidth for a wireless ISP. Internet Exchange Points (IXPs) are of particular relevance to LLDCs since they keep locally destined data traffic within the country, helping reduce costly Internet Protocol (IP) transit traffic. IXPs also improve quality by lowering latency, often serve as hubs of technical expertise, and are attractive to foreign and local content providers who want their content to be easily accessible within the country. Also, IXPs keep local Internet sites running if a country experiences disruptions to its international bandwidth. Despite their value, only half of LLDCs had an active IXP in May 2017. One quarter had no IXP and another 25% had IXPs that were inactive or not truly open exchanges (e.g., run by an operator rather than an independent association). Even in LLDCs with IXPs, it should be noted that many of the facilities are not exchanging a significant amount of traffic, suggesting some type of barrier such as non-participation by key ISPs. Among the nine case study countries, five have active, neutral IXPs. Among those without an IXP, two have little need: Ethiopia has just one ISP and in Bhutan, two ISPs account for the vast majority of subscriptions. In these cases, there is not a pressing need for an IXP given the market structure. In Tajikistan, operators prefer to exchange data bilaterally. In Lao PDR, the government has tried to establish an IXP but this has not been successful to date. Digital skills are essential to leverage the opportunities created by expanded Internet infrastructure. Internet-enabled services could be attractive for LLDCs since unlike goods trade, there is no need to physically cross borders. Of all the relations between Internet use and education, one of the best fits is gross secondary enrolment (Figure 2). This is because in the LLDCs, the Internet is primarily a youth phenomenon. There is a far higher share of young Internet users in relation to their population share. The finding that secondary school enrolment is most closely linked to Internet use reflects the youth impact, as well as the fact that there is an even higher link between a secondary education and Internet use as well as that in most of the countries computers and Internet access is available in secondary schools. There is a big gap between the three African case study countries and the others in both secondary school enrolment and Internet use. Botswana is the African exception with relatively high school enrolment and hence a higher level of Internet use. Therefore, Internet infrastructure deployment alone will not be enough to grow Internet use unless it is accompanied by investment in education.. Source: Adapted from UNDP, national statistical surveys and Authors’ estimates. The Government of Rwanda recognizes digital literacy is a major obstacle to its aspirations of the country becoming a Smart Nation. In early 2017, it launched the Digital Ambassador Program (DAP) where 5,000 youth will be trained and then posted to all 30 districts in the country to provide digital skills training to five million Rwandans over a four-year period. The DAP is a partnership between the Ministry of ICT, the Canadian NGO Digital Opportunity Trust (DOT) and the World Economic Forum’s Internet for All initiative. DAP would require each trainer to teach 250 people a year, which seems realistic based on current experience. If successful, it would dramatically boost Rwanda’s digital literacy to 85% of the population. It can be argued that LLDCs have better prospects for services exports since trade in services does not need to physically cross borders. Therefore, LLDCs compete on a more level playing field with other developing nations for services exports. In terms of Internet-enabled service exports, opportunities include computer services such as software exports and data processing as well as business services such as accounting, call centers, medical transcriptions, etc. delivered over computer networks. Few LLDCs are leveraging opportunities from Internet-enabled service exports to any noticeable degree. LLDCs are not perceived as computer outsourcing destinations and none figure in the list of 55 nations compiled in the Global Services Location Index. Not facing the sea need not be a barrier as there are three landlocked countries on the list (Czech Republic, Hungary and Slovak Republic). Just three of the 22 LLDCs for which data is available have computer services exports greater than five percent of total services exports and they are all Central European (Armenia, Macedonia, Moldova). They benefit from proximity to developed European nations and high levels of education. Nonetheless, LLDCs do have ambitions to develop ICT industries and tap export markets. The creation of specialized zones as hubs is one method being used. Kyrgyzstan High Tech Park The park benefits from low income tax (5%) and no corporate tax apart from a 1% levy for the directorate of the Park, for companies that export at least 80% of their output. As of 2016, the park hosted 27 companies turning over US$3.5 million and employing 251 people. The largest export markets are Kazakhstan, the United States, Ireland, Russia, and Japan. The KG Labs Public Foundation maintains a list and a map of startups and related resources, and is active in running contests, hackathons, and incubation and mentoring sessions, while Ideagrad.com runs an incubation program. Bhutan Thimphu TechPark Launched in May 2012, the TechPark offers office space and services for tech companies. It incubates start-ups via the Bhutan Innovation and Technology Centre (BITC). BITC provides six months free working space for startups, offers courses and competitions for entrepreneurs, and encourages overseas experts to spend time in residence sharing their experience. It currently has 15 startups, and the facility is now full, with further expansion in the pipeline. The TechPark has also attracted foreign firms, which mainly provide digital services outside Bhutan, using local talent forming an emerging ICT export industry. Rwanda Kigali Innovation City (KIC) KIC aims to unite multinational information technology firms with domestic startups alongside higher education institutions. The hopes are that the synergies from anchoring educational institutions alongside tech companies will generate innovative applications and services and help grow the domestic ICT industry as well as generate exports. Carnegie Mellon University of the United States is one of the core anchor institutions. An innovation lab and skills academy is planned. The projected impacts of KIC include 4,500 highly skilled ICT jobs by 2022 and export earnings up to an estimated US$ 180 million by 2022. The Knowledge Lab (kLab) features an open space with room for around 60 people providing free Wi-Fi. It organizes various events such as workshops and hackathons and offers mentoring to help turn ideas into business models. Next door is the Rwanda FabLab, which opened in 2016 as the first hardware space in Central Africa. There is a range of equipment for users to experiment with such as 3D printers, milling machine, and a computer controlled laser cutter. Ethiopia EthioICT-Village Inaugurated in 2015, EthioICT-Village features a data center and an incubator for digital startups as well as high-speed fiber optic connectivity and reliable electricity. Over 20 companies are currently housed there. It is hoped that international companies can be attracted given the park is inside an export processing zone and therefore has attractive investment incentives. It is also planned to leverage EthioICT-Village as an outsourcing hub. Ethiopia does have some experience in that area with exports as well as familiarity with English among university graduates. The way the Internet sector is nurtured and encouraged to grow is a function of the effectiveness of policy and regulatory mechanisms as well as high-level government commitment. While most LLDCs have adopted the common prescription of creating sector regulators and introducing competition and quite a few have ICT sector development plans, results are mixed. This is often related to hard to quantify but critical factors such as commitment, transparency and institutional independence. Most LLDCs have followed the advice of telecommunications sector reform prescribed by the international community. However, the devil is in the detail. All but two of the LLDCs have opened their mobile market to competition but the depth of competition varies, with a number of LLDCs exhibiting signs of high market concentration. Twenty-four LLDCs (75%) have a sector regulator although true independence is not always assured as it depends on the regulator’s management composition, how they are appointed and whom they report to. Concerning the legality of online shopping, 21 LLDCs have an electronic commerce law, but few have a thriving online shopping market often for reasons related to trust, payments, or interpretation and implementation of the law. A key indicator of whether sector reforms will be successful is how committed the government is. The World Economic Forum’s Network Readiness Index includes a survey question on the perception of the extent to which governments have a clear implementation plan for using ICTs to improve the country’s competitiveness (Figure 3). Rwanda ranks top among LLDCs and fourth in the world. This is not surprising given that President Paul Kagame has been a strong proponent of broadband and its critical role in development. This high level dedication to ICT is reflected in the country’s accomplishments. It has among the highest mobile broadband population coverage in the LLDCs and has deployed an innovative public private partnership for 4G/LTE rollout that aims to cover most of the population by the end of 2017. Another LLDC that ranks high in government commitment is Azerbaijan, ranking second within the group and eighth in the world. One of the areas where the Caucasus nation has achieved impressive results is in the use of ICTs in schools. The People’s Computer initiative resulted in more than 10,000 teachers being provided with computers, 1,200 schools connected to the Internet and digital skills training for 75,000 people. Overall, there are eight LLDCs where the perception of government ICT commitment exceeds the world average. Note: The question asked in the Executive Opinion Survey was “To what extent does the government have a clear implementation plan for utilizing ICTs to improve your country’s overall competitiveness? [1 = no plan; 7 = clear plan].” The highest ranked country was the United Arab Emirates with a score of 6.1. The chart shows how close countries are to achieving that score (i.e., country score / UAE score * 100). Note that Afghanistan, Burkina Faso, Central African Rep., Niger, South Sudan, Turkmenistan and Uzbekistan were not included. Source: Adapted from World Economic Forum Network Readiness Index 2016. The complexity of the information society means that in contrast with other sectors governments tend to have to rely on foreign firms and governments, local non-governmental experts, and industry to fulfill various roles in order for the whole to work efficiently, without consuming vast public resources or being left behind. A number of LLDCs have industry groups to represent ISPs and telecommunications operators. In most cases, this group has a relatively strong voice in public and with the regulator and ministry. Examples are BITS in Botswana and BICTA in Bhutan, which are both active in setting the agenda for Internet policy discussions and inputting into policy and regulation. There is far more variation in the involvement of civil society in discussions around the Internet, reflective of the fact that there are differing views globally about accountability, and about rights to expression and association and how these translate from the real world to the Internet. On the one end of the spectrum are the countries in which the government formally or informally chooses to exclude civil society (and often other third parties such as the private sector or multinational companies) from discussions and decisions around the Internet. On the opposite end of the spectrum are those countries in which government actively engages and sometimes defers to feedback from external stakeholders. In Rwanda, this is explicit policy with the non-profit organization RICTA working with government, and the government engaging with the Internet Society to address issues like content localization. Bhutan follows this approach as part of its overall approach to government, which is accessible, transparent, and agile. Similarly, the government of Kyrgyz Republic has also increasingly called on industry and civil society for input, and has actively engaged in stakeholder-led forums including having the Prime Minister addressing the Kyrgyz Information Technology Forum in 2017. Other countries lie between these extremes of government-dominated and stakeholder-led governance. For example, in Botswana there is a will to adopt international best practice in consultation and in policy generally, but this may be let down by poor implementation. Botswana appears to be a particular case where increased stakeholder involvement may speed up decision-making and lead to the better outcomes that would be expected from a country with its wealth and education. LLDCs vary more than other international groupings based of specific conditions such as Small Island Developing States (SIDS) or Least Developed Countries (LDCs). Some LLDCs are ahead of many non-landlocked countries in trade efficiency illustrating that having to pass through transit countries need not be a barrier. Similarly, in terms of access to undersea submarine cables, some LLDCs are well provisioned with capacity and pay prices less than many sea-facing countries. These LLDCs have largely overcome the barriers of being landlocked. This report has shown that some LLDCs are successfully exploiting the Internet to minimize the condition of being landlocked. The Internet is used for trade facilitation to eliminate paperwork and streamline processes through networked access for participants through single windows. Proactive policies such as open access and wholesale competition in some LLDCs have resulted in the deployment of fiber optic backbones to key border points for onward transmission of international Internet traffic to undersea fiber optic facilities. Some LLDCs have also established an enabling framework for Internet-enabled services; though take-up is generally low, this is due more to underlying socio-economic conditions. The lessons learned are that the Internet can help countries overcome the barriers of being landlocked but will only have a significant impact if accompanied by a pro-active legal and regulatory environment accompanied by good governance. The best customs software in the world will be of little use if it cannot interoperate with that of border countries, a high capacity national fiber optic backbone will be underutilized if it is under monopoly control with high wholesale prices and a state of the art online shopping platform will have few users if e-payments are not allowed. Very few LLDCs have a balanced Internet ecosystem. While some like Rwanda, are strong in infrastructure and government commitment they are lagging in digital skills. Others like Azerbaijan have good infrastructure and skills but the Internet economy is relatively undeveloped. The evolution of the Internet needs to be more balanced across infrastructure, skills, digital economy and governance for the full impacts to be felt. Facilitating trade Recommendation 1: LLDCs should aim implement automated single windows that provide access over the Internet to the entire universe of institutions and companies involved in trade with facilities for e-payments. Given that all LLDCs rely on transit countries, it is imperative that customs systems be linked through regional single windows using open protocols and international standards to minimize problems caused by proprietary systems. LLDCs also need to leverage digital tools such as IoT, tracking systems and big data that make trade more efficient. Expanding infrastructure Recommendation 2: LLDCs should aim to increase domestic backbones and in particular to all border crossings to enhance options and redundancy for international connectivity. This can be achieved through various models such as a competitive backbone market, public private partnerships or wholesalers with the aim of achieving open and cost-based access. This can be further encouraged through swapping and sharing, and making public rights of way (roads, electricity pylons) available for fiber deployment. Governments could also create scale by aggregating demand and pre-purchasing connectivity to border posts, and may wish to consider the business case for deployment of additional infrastructure at borders (e.g., small data centers). Recommendation 3: Governments and operators in LLDCs should work with multilateral bodies (e.g., development agencies or regional communities) to promote competition in delivery of connectivity to inland borders of their neighbors, through regulation, funding of redundant routes, reducing administrative requirements for new infrastructure, or contributing public rights of way. Recommendation 4: Where costs to connect from the coast to inland borders are very high, either some form of subsidy or a regional trade agreement may be required. Subsidies could take the form of funding of construction costs, direct or indirect price subsidy to suppliers or users of the routes, or support for demand aggregation and long-term contracting to reduce unit prices. A regional trade agreement could the form of a cost-based transit price from the LLDC border to submarine cable landing stations. Fostering skills and entrepreneurship Recommendation 5: Given the close link between secondary school enrolment and Internet use governments need to invest the necessary resources to boost secondary school participation. This is also particularly relevant bearing in mind Sustainable Development Goal 4 calling for universal secondary education by 2030. Investment should also include computers and Internet access, which can be facilitated through universal service funds and corporate social responsibility programs. Those out of school should not be left behind and digital literacy programs should be developed leveraging facilities such as vocational schools, libraries and community centers. Recommendation 6: Government, industry and development partners should explore options for developing a services export industry, having regard for language compatibility and the level of skills available and varying from call centers to business process outsourcing to software development. Options could be evaluated based on the number of jobs likely to be created in the medium term and the contribution towards exports. Supportive governance Recommendation 7: LLDC governments should, in consultation with industry and civil society, identify sector governance activities, which may benefit from non-governmental input. These may include but are not limited to domain name management, innovation park planning and development, promoting local content development and local traffic exchange, authoring new laws on electronic communications, cyber security, and planning for e-government. Recommendation 8: LLDC governments need to ensure continuity of political and civil service leadership on ICT issues, and ideally for such leadership to be visible and accessible to industry and civil society. Ferro, Cécile, Marilyne Youbi, Dorina Georgieva, Valentina Saltane, and Inés Múgica. 2016. “Technology Gains in Trade Facilitation.” In Doing Business 2017. Washington DC: World Bank. http://www.doingbusiness.org/reports/global-reports/doing-business-2017. 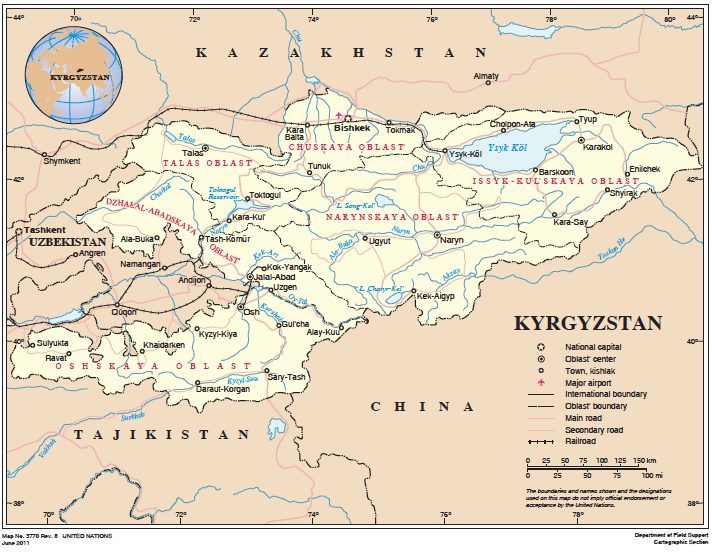 The Kyrgyz Republic is bordered by Kazakhstan to the north, Uzbekistan to the west, Tajikistan to the south-west, and China to the east. China is its only maritime neighbour, but is accessed via one of two difficult mountain passes, with Chinese ports more than 3,500km beyond these passes – although China’s proposed Belt and Road Initiative envisages improving this corridor. The closest sea coast is Pakistan, three borders away (Tajikistan and Afghanistan lie between). As a result, the bulk of trade and connectivity currently comes via Kazakhstan and Russia, which have better transport corridors despite ports being over 3000km away. Kyrgyzstan is a transit route in this direction for Tajikistan’s goods and connectivity. Like most countries in the region, more than three-quarters of Kyrgyzstan is mountainous. Out of a land area of 191,801km2, the easternmost regions of Naryn and Ysykkôl make up around 80,000km2 (42% of total) but only 760,000 (12%) of the 6.1 million population. Around 60-65% of the population lives in rural areas, but agriculture contributes only 15% of GDP, down from 50% in the 1990s. The most densely populated areas are around the capital Bishkek in the north, home to around one million people, and near the Uzbek border in the west (around Osh and Jalal-Abad, together about 2.7 million people), which is home to most of the country’s largest minority, the Uzbeks, around 15% of the population. Ethnic tension between Uzbeks and Kyrgyz has occasionally (notably in the 1990s and in 2010) spilled over into conflict that threatened civil war, although the conflict is also partly driven by continuing poverty and endemic corruption. In 2018 ISOC began supporting an open and neutral Internet Exchange Point in the Ferghana Valley. Located at the crossroads of Kyrgyzstan, Uzbekistan, and Tajikistan, this populated region (14 million) has been a site of inter-ethnic tension. The IXP will increase affordable connectivity while encouraging collaboration between various stakeholders in the region. The main languages are Kyrgyz, of Turkic origin, but now written using Cyrillic script, and Russian, which has been an official second language since 1997. Education is good, with 99.2% of adults literate and children receiving on average just under 11 years of schooling. Gross National Income (GNI) per capita declined from $1,250 in 2014 to $1,100 in 2016 due to a wider regional slowdown although adjusted for purchasing power, income has risen consistently since 1995. Personal remittances from Kyrgyz working abroad accounts for more than a quarter of GDP, where an estimated 500,000 Kyrgyz work in Russia alone. Trade with Kazakhstan dominates from a regional perspective, although gold, making up 43% of exports, typically heads to European countries. More than a third of Kyrgyzstan’s imports come from China, and a further quarter come from Russia. Since August 2015, Kyrgyzstan has belonged to the Eurasian Economic Union, a single market of 183 million people, along with Russia, Kazakhstan, Belarus, and Armenia. The World Bank’s 2017 Country report advises that for investments and exports to grow, policy changes should be made to increase competitiveness. It also forecasts a positive upward increase in GDP. Kyrgyzstan has had a customs “Single Window” in place since 2013, following preparations that began in 2006. The challenges encountered in the project had little to do with infrastructure or technical skills; indeed, most were about legal issues (e.g., recognition of electronic documents), flawed business processes, and lack of political authority in the implementing agency. Technical assistance was provided by British firm Crown Agents using Microsoft technology and their own system architecture. The project may still need additional time to take hold as OECD continues to rank Kyrgyzstan poorly compared to non-OECD European and Central Asian peers in terms of harmonisation of documents, and automation. This ranking is particularly discouraging given that these are the very issues intended to be addressed through a Single Window. Despite this criticism, Kyrgyzstan is ranked higher (at 79th globally) than all of its neighbours and Russia in the World Bank’s Trading Across Borders index which looks at the time, cost, and complexity of exporting. With (in principle) no customs controls in place with its biggest trading partner Kazakhstan, there now remains the daunting challenge, as part of the Eurasian Economic Union integration, of developing a reference model for the integration of all member states in the Single Window systems. The Kyrgyz mobile market has seen rising and falling fortunes for a number of operators. It is currently dominated by operators using GSM and UMTS technologies: Alfa Telecom (branded Megacom) and Sky Mobile (branded Beeline) each have around 2.9 million subscribers, while relative latecomer Nur Telecom (branded O!) which launched in 2009 has around 2.2 million. Aktel, Katel, and SoTel (no longer in operations), used CDMA or TDMA technologies and reached their peak around a decade ago and accounted for approximately 200,000 subscribers. Megacom claims 99% population coverage with its 2G network, and most other operators claim 90% or below, with data services typically available to 60% or less of the population – understandable given how much of the population lives in mountainous rural areas (2G coverage). These operators are commonly privately owned with Kyrgyz or regional (Kazakh/Russian) shareholders. Beeline is majority-owned by Russian-originated operator Vimpelcom. Following some shareholder disputes Megacom has been wholly state-owned since 2014, notwithstanding several attempts to find a buyer. Kyrgyz Telecom, the fixed incumbent with around 349,000 active lines at the start of 2017, also remains majority state-owned despite several attempts to sell it between 2003 and 2010. Elcat is the largest private local broadband internet service provider with market share of up to 70% of transit internet (30% is for Kyrgyz telecom) going to Tajikistan. 800MHz and 2600MHz spectrum has been awarded to the three GSM-family operators, as well as to new wireless operator Saima in 2011; LTE services are now available in an increasing number of locations and WiMAX continues to be widely used. One GB of mobile data costs 2.98% of income per capita (102nd most affordable globally, and cheapest in the Commonwealth of Independent States (CIS)) and the fixed broadband sub-basket 8.58% of income per capita (129th globally, and again cheapest in the CIS). The broadband market appears competitive in urban areas, mostly using wireless with some using Asymmetric digital-subscriber line (ADSL), There do not appear to be plans for a significant rollout of FTTx. There were estimated to be 238,000 new broadband subscriptions in early 2017, for a household penetration of 17.6% according to the ITU’s Measuring the Information Society Report. Nevertheless, Kyrgyzstan scores poorly in the ITU’s ICT Development Index, coming in last in the region and declining five places from 108 in 2015 to 113 in 2016. This is mostly driven by poor access achievements: a small number of fixed lines, relatively few mobile broadband subscriptions, and limited household access to computers and internet. ISPs have previously indicated that domestic capacity is relatively expensive and fibre quality is poor. As far back as 2000 a fibre link was constructed to connect Bishkek to the Trans Asia Europe consortium cable system stretching from Frankfurt to Shanghai. There does not appear to have been much further development of domestic fibre until 2009, so the country was heavily reliant on microwave backhaul until then. Subsequently there have been connections to the Chinese, Tajik, and Uzbek borders as well as a ring connecting Bishkek, Naryn, Osh, and Jalal-Abad. Kyrgyz Telecom owns most of the national fibre but Megacom has also deployed on major routes, including the national ring. As discussed above, Kyrgyzstan is very far away from coasts and ports. Although it is now connected by fibre to China (where some experts estimate 2.5Gb connection capacity between China and Kyrgyzstan), and there are plans for fibre build-out through Tajikistan, Afghanistan, and Pakistan to reach submarine cables. Currently, the only routes to the Internet are via Kazakhstan and Russia. Any licensed operator in the Kyrgyz Republic can build fibre, and up to six operators were reported to connect at the Kazakh border in 2015. Wholesale Internet connectivity at that time cost US$4 per Mbps per month in Russia, US$15 in Kazakhstan, and US$40 or more in Kyrgyzstan. By the end of 2016, there were two major providers of fibre internet in Kyrgyzstan: Elcat and Kyrgyztelecom. Both providers control 50% of internet traffic in the country, with Elcat having a competitive advantage of bandwidth capacity over 5Mbps. Kyrgyz Telecom has a seemingly greater coverage area as they include ADSL connections that start at 256Kbps. Experts indicate that in 2016, Elcat sells roughly 30Gbs of transit traffic from Russia to Tajikistan for US$30-100, while purchasing it at US$5-12.00. In 2015 total bandwidth consumption had been over 40Gbs, while in 2016 it had reached 90-100Gbs due to drastic price decreases over a two-year period (2014-2016). In 2014, Kyrgyz Telecom was buying US$100 per Gbps, while others had been buying at US$30-50.00. Total internet traffic from Kyrgyzstan to Russia had been roughly 60Gs in 2016. As of September 2017, Elcat paid roughly US$5.00 per Gbps per month, Aknet paid US$8.00, and other operators from US$10.00 to US$15.00. In 2017, bandwidth consumption was estimated to double, particularly due to LTE penetration and intra-market competition. The share of mobile internet usage is over 60% based on local internet site usage analysis. It is likely that these prices will increasingly converge and that the phenomenon of billing retail Internet users for usage will disappear as has happened elsewhere when prices have declined in this manner. In 2012 total international bandwidth usage was3 5Gbps, equating to 0.893Kbps per person, and was estimated to be doubling each year. The Kyrgyz IXP is governed and managed by the Kyrgyz Association of Telecommunication Operators (Operators Association) [and located in a Kyrgyz Telecom facility]. The Operators Association created a set of rules that governs the IXP and establishes an organizational foundation, membership parameters, and technical parameters. Under these rules, the IXP is accessible for members of the association; according to the association’s website, there are 18 members—all of whom exchange traffic at the IXP. The rules seem to provide a neutral basis for local ISPs who operate and participate in the IXP. Operators who provide local service are able to bring their own fibre to the IXP in order to peer with each other and to exchange local traffic. Currently, according to its rules, the Kyrgyz Association of Telecommunication Operators does not allow international ISPs, content providers, or data-centre operators to exchange traffic at the IXP. In our view, this limits opportunities for Internet development in the Kyrgyz Republic. There does appear to be a reasonable degree of public peering compared with some other LLDCs in Asia, with Elcat, Megaline, IPnet, AKnet (formerly a purely educational network and now fully commercial since 2012), and Saima each connecting with four or more other local autonomous systems. Unusually, the .kg domain has been delegated to a private company, AsiaInfo Telecommunication Enterprise, since 1995. It acts as the registry and the sole registrar for second level domains which cost around US$35 (although other firms can provide third level domains). The domain registration process can be done online, although the instructions suggest that offline evaluation of applications may be undertaken. There are estimated to be 10,609 domains registered under .kg which is more than in some peer landlocked countries in the region (e.g., Tajikistan and Afghanistan) although far fewer than more populous neighbours Kazakhstan and Uzbekistan. Local Kyrgyz experts are working with the community to try and encourage price reductions. Adult literacy is estimated at 99.2% in 2015, and Kyrgyz people receive nearly 11 years of schooling on average, which means that the country is well positioned to encourage both use of Internet and development of technology. Although Russian is an official language, only 26% of young people are reported to have mastered it, and only 2% speak English – which means many Kyrgyz are unable to access content in any language widely used on the Internet. Goods and services are increasingly available online but there is reportedly still a heavy reliance on cash, and perceptions of poor quality and poor customer service when purchasing on the internet. UNECE had been planning to release an updated report on the knowledge economy in Kyrgyzstan. There are estimated to be 2,076,220 internet users, or 34% of the population. There are 1.1 million Facebook users, equating to 18% penetration of the total population, and perhaps half as many again VKontakte users, which is consistent with this overall estimate. However, available data indicates that the number of new internet users has been declining since 2014, suggesting a plateau is being reached – a plateau which may be related to poor availability of broadband outside the urban areas which are home to 35-40% of the population. Authorities have recently begun clamping down on political criticism on social media, which may chill general internet activity. Other local experts indicate that Internet consumption is increasing in rural areas, and that the lack of “user” uptake may be the lack of content in the Kyrgyz language. Anecdotal evidence from 2014 suggests that state universities are underfunded and out of step with global technology developments. To address this, an industry body called the Kyrgyz Software and Services Developer’s Association (KSSDA) was launched in 2008 to support fast-track training initiatives and lobby for policy to grow the industry. It was a key player in the 2011 passage of legislation to launch the IT Park (also referred to as the High Tech Park), a zone which benefits from low income tax (5%) and no corporate tax apart from a 1% levy for the directorate of the Park – but only for companies that export at least 80% of their output. As of 2016 it hosted 27 companies turning over US$3.5 million and employing 251 people (for an average of US$14,000 per employee) – although revenue for 2017 looks set to double with the addition of four new companies. The largest export markets are Kazakhstan, the US, Ireland, Russia, and Japan. In addition to the formal government efforts described above there is a robust tech startup ecosystem developing. The KG Labs Public Foundation (kglabs.org) maintains a list and a map of startups and related resources, and is active in boosting the overall Internet ecosystem, running contests, hackathons, and incubation and mentoring sessions, while Ideagrad.com runs an incubation programme. Overall it appears that a combination of entrepreneurial spirit and government support has yielded success in terms of expanding Kyrgyzstan’s trade in IT services. The latter provides a natural advantage, namely an average wage for software engineers around half that in Russia and Kazakhstan and potentially one tenth of that in Western countries, but wages are still 5-10 times higher than in India. The Kyrgyzstan’s telecommunications regulator is the Information and Communications Agency (ICA) under the Prime Minister. The applicable legislation is the Telecommunications Law of 1998. This law was drafted to support Kyrgyzstan’s accession to the WTO, a process which started in early 1996 and concluded at the end of 1998, and therefore included commitments towards liberalization of the market. Under the country’s first president, Askar Akayev, a National Strategy on Information Technologies was developed19 in 2002, with the aim of catching up to more rapidly developing economies in terms of bandwidth and Internet speed by 2010. The collapse of his government in the Tulip Revolution of 2005 reduced the momentum of this strategy, and the next six years of turbulence and alleged political criminality are likely to have severely distracted the government from internet development issues. However, a new coalition government and new president in 2011 brought increased stability, and they signed into law the IT Park described above which demonstrated a serious financial commitment of the government to the cause of developing the ICT industry. It is hard to find many things wrong with the Kyrgyz Republic’s approach to digital development, as a landlocked country. There has been a clear recognition that trade in services is important for the country’s economic development and to substitute for the logistics-heavy raw material exports that have supported the country to date. The backbone has been well developed and a choice of transit countries is available, even if reliance is primarily on Kazakhstan. And ICT in government is seen as both a critical defense against corruption and a pillar supporting public service efficiency, including in exports (exemplified both by the Single Window for trade and the electronic visa system for visitors). If there are any criticisms to be made, they would be around implementation. It remains to be seen whether formal ICT education can be reformed to be more appropriate to industry’s requirements, and there may be further work to be done in bringing software engineers out of the black economy. Given the grand scope and scale of the Taza Koom project that extends to more than 20 years, there will be many implementation challenges—but the vision appears big enough that any progress will deliver major benefits to the country. As of 2016, the population of Tajikistan was approximately 8.7 million people, of which 27% lived in urban areas. With a land area of 141,510 km2, the country is slightly larger than Greece. It is bordered by Uzbekistan to the west, Kyrgyzstan to the north, China to the east, and Afghanistan to the south (Figure 1). China is its only maritime neighbour, although the nearest Chinese ports are 4,000 km away. Mountains cover more than 90% of the country, and desert covers the southeast corner. Three quarters of the population lives in two fertile lowlands in the west: the Panj River Valley towards the south (where the capital Dushanbe is located), and the Fergana Valley that extends to the north—together, these regions account for more than a third of the country’s land area. Tajikistan’s gross domestic product (GDP) per capita in 2016 was US$ 796, down from a peak of US$ 1,104 in 2014. In purchasing power terms, however, the World Bank reports its income per capita as steadily increasing since the late 1990s, when a five-year post-independence civil war ended. The civil war, which started in the early 1990s, devastated the country, and the collapse of the Union of Socialist Soviet Republics (USSR) left Tajikistan as the least economically developed of the Soviet republics. It continues to be Central Asia’s poorest nation. From 2006 to 2016, 25–50% of the country’s GDP was generated by remittances of cash from abroad, mostly from Tajiks working in Russia. There have been reports of Tajikistan’s interest in joining Russia and the four other countries that make up the Eurasian Economic Union; one major reason may be to make it easier for Tajiks to work in Russia. Tajikistan is a member of the Commonwealth of Independent States (CIS), the Eurasian Economic Community (EEC), and the Shanghai Cooperation Organization (SCO). Agreements with the first two organizations regulate transit of goods through other members. In 2015, gold and other metals and minerals made up approximately 68% of exports, with raw cotton making up an additional 10%. Nearly 60% of exports went to Turkey, Kazakhstan, and Switzerland. (Switzerland is the destination for all of Tajikistan’s gold). Politics in the country is dominated by the People’s Democratic Party of Tajikistan, which has held more than 50 of the 63 parliamentary seats since 2005. The party’s leader Emomali Rahmon has been actual or de facto President of the country since 1992 and was designated “Leader of the Nation” by the Tajik parliament in 2015. Tajikistan continues to rely heavily on Russia for security, particularly in addressing Islamic extremism and trade in drugs from Afghanistan. Russia, France, and the United States maintain regular military presence in the country, largely due to its proximity to the current conflict in Afghanistan. In terms of trade facilitation, the European Union assisted Tajikistan with a €1.2 million trade and customs project from 2012 to 2014 in order to implement a “Single Window”. A consortium of European companies implemented the project, resulting in the implementation of an e-customs solution, which might be the first step in a Single Window that integrates the responsibilities of multiple agencies. The system (http://trade.swtrade.tj/) is used by 11 state agencies and one public organisation, and is involved in issuing permits for export, import, and transit. The system has subsequently become complex and costly to maintain and extend. A replacement system is being developed by Crown Agents of the United Kingdom with funding from the Asian Development Bank. The new system is scheduled to launch on 1 January 2018. To date, customs facilitation software has not sped up trade for Tajikistan, which is ranked 144th in the World Bank’s Trading Across Borders indicator. It is worth noting, however, that the country has improved in its ranking since 2010. Tajikistan’s mobile market is active, but in recent years both subscribers and revenue have fallen. Tcell, owned by the Aga Khan Foundation for Economic Development and the result of a merger of two previous mobile operators, is a market leader with approximately a third of the market. Babilon Mobile, launched in 2003, upgraded to 3G in 2005 and 4G in 2012, and is privately owned by mostly local investors. Beeline/Tacom, launched in 2005 and was 98% owned by regional operator Veon. New reports indicate that Beeline/Tacom sold their stake and effectively have stopped operating in the country. MLT MegaFon, is 75% owned by Russian mobile operator MegaFon and 25% held by state-owned Tajik Telecom. A fifth operator, TK Mobile, launched in 2004 with majority ownership from China’s ZTE using CDMA technology; it was reportedly winding down operations in 2016. Population coverage of GSM networks is high—close to 100% of the population. Official statistics on the ICT sector are limited. There were 9.5 million mobile subscriptions in 2016—more than one subscription per person. Subscription rates dropped from 10.5 million the previous year mainly as a result of the government’s SIM registration ruling, which required positive identification for any SIM purchased, and imposed a maximum of two SIMs per individual. The identification requirement extends to all technologies; Internet service providers (ISPs) are required to positively identify their customers, as well. The high rate of mobile penetration is confirmed by the most recent demand-side survey conducted in 2012 by the Statistical Agency of Tajikistan finding that 93% of households had a mobile phone (SA, 2013). In contrast with global trends, the International Telecommunication Union (ITU) reports that fixed telephone subscriptions have more than doubled since 2000—to 468,000 by the end of 2016—but there are only an estimated 6,000 wired broadband subscriptions. There are no reported plans for mass rollout of FTTH networks, but ISPs Babilon-T and Telecomm Technology have rolled out limited FTTB in major cities, using Ethernet cable for the final connection and offering 100 Mbps speeds, even though international traffic on these connections is often limited to only a few Mbps. Approximately six other ISPs use fixed and wireless access to reach customers. Given limited wired broadband penetration, most Internet access is from wireless networks. All of the Tajik operators launched 3G several years ago, making them the first to deploy the technology in Central Asia. Coverage is estimated at around half the population. Babilon (in 2012), TCell (in 2014), and MegaFon (in 2016) have deployed 4G/LTE networks with coverage largely limited to urban areas. Tajikistan has one terrestrial fibre connection to each of Afghanistan, Kyrgyzstan, and Uzbekistan. A link to China, the only neighbor directly connected to international submarine cable networks, has been in the planning stage since 2008 (Internet Society, 2017), but still not been implemented. All routes east are via Urumqi, creating a potential single point of failure. The closest access to submarine cables is via Afghanistan and Pakistan, both challenging places to deploy infrastructure. However, there is an intention to deploy fibre on electricity infrastructure being planned across Afghanistan’s Wakhan Corridor into Pakistan (the Digital CASA project). Up until now, routes to the global Internet have been either via Uzbekistan, which is on the route of the Trans-Asia Europe cable from Frankfurt to Shanghai (Internet Society, 2017), or across Kyrgyzstan and Kazakhstan to Russia. International terrestrial connectivity currently totals 10 Gbps (about 1.1 kbps per person). The price is reported to be around US$ 55-75 per Mbps—more than five times the price in Kazakhstan (Internet Society, 2017). This may be due to a “double marginalization” problem on the routes via Uzbekistan or Kyrgyzstan that leads to prices of US$ 65-80 per Mbps just to cross Kyrgyzstan and US$ 100 to cross Uzbekistan. Options are improving: Uzbekistan is rumored to be liberalising its market, another operator (Elcat) is planning to build infrastructure in Kyrgyzstan and offer prices below US$ 50, and the Digital CASA project may add a route via Afghanistan and Pakistan. The price may even be lower via China (US$ 35-40), but poor reliability of domestic connections towards that border prevents that route from being used. Tajikistan’s domestic long distance fibre-optic network extends to 2,500 km. It consists of a backbone in the west that connects to Khujand in the north, to Dushanbe, Qurgonteppa, and Kulob in the south, and with radial links emanating from each city, plus a single route to the Chinese border. While the network in the South is reliable, routes towards the Chinese border are regularly damaged by winter weather that incurs repair times of about a month. Capacity costs on the domestic network are reasonable—for example, on the Dushanbe-Khujand route the cost is about US$ 7000/year for a 1 Gbps circuit (Internet Society, 2017). Since 2003, the .tj country-code top-level domain, registration has been delegated to a state entity. Any ISP is eligible to act as a domain registrar, although registry operations are manual and therefore slow. According to border gate-way protocol (BGP) data on the architecture of the Internet, not one of the Autonomous Systems (AS) in Tajikistan is connected to any other AS. The Association of Tajik ISPs mooted an IXP as far back as 2005, but there was resistance from operators, who “preferred to maintain bilateral peering connections.” While this practice typically costs more, some ISPs’ believe they have greater control over the connection and speed may increase marginally, while at the cost of inhibiting the growth of neutral content providers and at times making content access between ISPs difficult. The Internet Society has recently undertaken an assessment for the introduction of an IXP (Internet Society, 2017). There are no carrier neutral data centers in the country, and no data centers with international certification (Internet Society, 2017). No major content providers (e.g., Google or Akamai) host caches in the country; the closest content providers are in Kazakhstan. There are a number of government data centres, as well as ones operated by the telecommunications companies. This suggests that there is demand, but also resistance towards sharing infrastructure. Tajikistan benefits from high education levels. Average formal education attendance is for more than 10 years, and 99.8% of the adult population is estimated to be literate. Despite the relatively high level of education, it does not appear that Internet use is as high as it might be. There have been no recent surveys on Internet use. A 2011 survey reported Internet penetration at 11% of the adult population. In 2012, 12% of households had a computer—with a big difference between urban (25%) and rural areas (7%) (SA, 2013). This figure had not changed three years later, although it also reflects that most people are accessing the Internet via mobile devices. On the other hand, social media usage (e.g., Facebook and Russian social media sites) has skyrocketed. Facebook is the 19th most popular website in the country and the number of users increased eightfold between 2011 and 2017. Assuming one quarter of Tajik Internet users access Facebook (the similar ratio was 5% in 2011), then Internet usage is estimated at around 20% of the population in 2017. Lack of local content appears to be a barrier to greater use of the Internet. Farsi and Dari (spoken in Iran and Afghanistan) are easily understood by Tajiks, but written in different scripts so online content is not easily shared with those countries. Efforts to produce software to transliterate between scripts have failed. Few Tajiks speak or understand English. While knowledge of Russian is reportedly becoming less prevalent among younger people, the lure of migrant work in Russia means that there is still an incentive to learn it. There is a critical mass of Russian speakers (primarily urban), and an estimated 80% of downloaded content in Tajikistan is in Russian. Without substantial local content, younger audiences may find less to attract them to the Internet, although user-generated content on social media remains a strong lure. Mainstream schools are increasingly teaching Russian, Chinese, English, and Turkish, so the situation may evolve. Interestingly, national legislation prohibits students from bringing mobile phones to school, including higher education, reportedly to improve the quality of education. Another barrier both to uptake and development of the digital economy is affordability. Fixed Internet costs represent more than 25% of income per capita, and many service providers charge a premium for international traffic. Local traffic, which makes up an estimated 20% of all traffic, is typically included at no extra charge. (Internet Society, 2017). One GB per month of mobile Internet is more affordable at 6.5% of per capita income, but that means users must limit their usage, and mobile broadband coverage is still not nationwide. Tajikistan does not host any technology hubs, coworking spaces, or industry-sponsored innovation centres, however the Open Society Initiative occasionally sponsors hackathons in an effort to promote the use of open data. So-called technology parks have been established (following legislation) at the Tajik State University of Commerce and at least four other universities, but these are simply computer laboratories with some additional equipment, and used mainly for academic and teaching purposes—vastly different from the typical definition of a technology park. Anecdotally, it appears that specialist IT skills are available in the Tajik market. Local firms are able to find the skills they need, but may pay relatively high fees for them. For example, to implement a public-finance management system (PFMS) between 2010 and 2015, almost 30 IT specialists were recruited to provide software customisation and implementation (World Bank, 2015). In order to retain the staff, the Ministry of Finance offered competitive salaries. The project was delivered on time, on budget, and with the desired results. The IT specialists, who reportedly wrote 90% of the code for the project, have in turn advised other countries on the use of the software. The small number of local IT firms working on some international projects, mainly work for Canadian, Kazakh, and American clients. A company run by Tajik expats in the United States bids for bespoke software projects and outsources the work back to individuals in Tajikistan. Much of this export activity is not visible, as software developers frequently do not declare their income or even set up companies because of high taxes. There are a limited number of companies exporting packaged software systems, such as expresspay.tj, that offers point of sale terminals and applications to process payments. There have been efforts to establish a business process to outsource industry in Tajikistan. Notably, a World Bank-funded study visit to Bangalore in 2011, but little has happened since then. Companies with operations in Russia, including mobile operators Megafon and Beeline, operate Tajik-language call centers for their expat customers in Russia as an add-on to existing call centers. Russian is sufficiently spoken to support a wider Russian-language call center industry, but Tajikistan faces competition from countries like Belarus, which are more closely linked to Russia and have lower labor costs. Outsourcing from Iran does not appear to have been explored due to the written script difference and historic lack of contact. Fixed incumbent Tajiktelecom was separated from the Ministry of Communications in 1996, when the Ministry became the sector regulator in preparation for liberalisation of the market. In 2011, it evolved into the Communications Service, which today retains policy and regulatory responsibility for the sector, as well as oversight of Tajiktelecom, and reports to the Tajik President. The Service is not an independent regulator, although one is planned (OSCE, 2015) as a WTO membership commitment and as part of the country’s strategy to 2030. A Universal Service Fund that was promised in 2006 has not been established. There is little visible activity and no website for the Communications Service. The government retains 95% ownership of fixed incumbent Tajiktelecom; it has missed numerous self-imposed deadlines since 2004 to divest this ownership, and with WTO membership secured in 2013, there is no longer a reason to sell—the company has been put on a list of strategically important government companies that will not be sold. There is a view within Tajikistan that when commitments made to the WTO—specifically those regarding privatisation, regulation of the industry, and taxation—become binding in March 2018 (five years after accession), the government will be forced to reform or face legal challenges. It is hoped that an independent regulator will be established due to this process. Create favorable conditions for the development of infocommunication technological parks network. The Strategy includes a commitment to expand use of modern technology, establish a regulator, bridge the digital divide, attract private sector investment, and develop cross-border infrastructure. It remains to be seen whether this strategy can be implemented. At this stage, the country has no broadband plan that has been made available to the general public, and it is not clear which agency would lead on ICT. A national ICT council established in 2006 to promote dialogue between industry and government has met rarely, the last time reportedly in 2012. The Ministry of Education alone is notable in having taken concrete steps towards expanding use of Internet in teaching and research. It is unlikely that any of these goals can be achieved without the long-overdue reform of the governance of the electronic communications sector. As indicated, some in the industry are poised to pursue legal routes to achieve this reform via enforcement of WTO obligations. Furthermore, it appears that some government projects, such as the original Single Window implementation, failed due to interagency disagreements and lack of cohesion across various departments involved. Similar issues appear to have led to separate data centres being deployed by the Ministry of Finance, the Ministry of Foreign Affairs, customs entities, tax authorities, and Single Window— against advice to share facilities and costs. Delivering on a Tajik national ICT strategy will need a more cohesive action and operationalization plan. Tajikistan’s government periodically asserts control over the Internet and use of data. In January 2016, a law was passed to create a central hub, operated by Tajiktelecom, that would require all ISPs and mobile operators to provide services only via a proposed “Single Communication Nexus” for cybersecurity reasons. Some observers believe the primary reason is, in fact, for the government to charge monopoly fees for the operation of such a facility in order to support public finances. The government also has, in the interest of maintaining security, ordered recurrent blocking of online services, websites, and messaging. Taxation on the industry is a concern. A dispute with tax authorities delayed and almost led to the cancellation of a deal to transfer control of Tcell to a new owner, and both Veon and MegaFon have publicly considered withdrawing from the country over similar disputes with the tax authority. Taxes are estimated to add 33% to the cost of Internet connections, thereby undermining access to the Internet in a country where affordability is already challenging. In fact, taxation has become an issue for all sectors—not only electronic communications—due to the ongoing economic challenges in the country. Observers suggest that while the taxes may not be fair, they are official and have been found by courts to be legal. Conversely, the Tax Committee has been lauded as an excellent example of e-government. The Public Finance Management System has been successful in terms of improving efficiency and transparency of government budgeting and spending, and an online tax system is both highly regarded and widely used. These achievements illustrate that the government is capable of delivering complex IT projects, which bodes well for the future of ICT in government. The government has demonstrated a commitment to multistakeholder governance of the Internet. In 2017 it hosted the second Central Asian Internet Governance Forum (CAIGF), co-organised by civil society parties including the Internet Society, and a range of stakeholders. The Tajikistan government is faced with numerous challenges: conflict in neighbouring Afghanistan, Muslim extremism, drug trafficking, overreliance on remittances from Russia, and a lack of revenue that has driven the government to raise taxes to the point that they deter economic activity. Against this backdrop, the government’s lack of leadership in the ICT sector is perhaps understandable—attention given to the mining sector is likely to make a significantly bigger difference to the country’s economy. Indeed, the government is more likely to consider the Internet a security threat than an economic opportunity, particularly given declining revenues in the telecommunications sector. The Tajik government has an ideal partner in addressing the problem: its own population. Capable people are running civil society organizations, and can offer excellent advice on setting up IT parks with limited tax exemptions. With more Internet and software firms operating visibly, more opportunities may develop to identify ways the government could save money and reduce corruption via the use of IT systems in government processes—perhaps even offering a return on investment of 41%, as achieved in the Public Finance Management System project. The government should continue its efforts to identify potential cost savings in partnership with local industry experts, starting with rationalising government use of data centres. This would likely be part of a formal national broadband plan that should also aim to maintain and widen ICT skills, potentially support investment in call centres, and consider whether community Internet centres are required to make access to government e-services universal. The government should move ahead with the creation of an independent regulator. There is widespread expertise inside and outside of Tajikistan on best practices for setting up a communications regulator, and there is likely to be plenty of support from development partners. Government of Tajikistan (GoT). 2016. National Development Strategy of the Republic of Tajikistan For The Period To 2030. https://ims.undg.org/ downloadFile/409a75e9857377a5710de8d58cc3f9ebcdc9d850e834201a6ae0f2f7d07b4aaf. Internet Society. 2017. Tajikistan Internet Exchange Point Environment Assessment. https://www.internetsociety.org/doc/tajikistanixp. Kosimov, Rustam, ed. 2012. Tajikistan Electronic Readiness Research. Dushanbe: Public Fund “Internet” Tajikistan. Organization for Security and Co-operation in Europe (OSCE). 2015. Feasibility Study on the Establishment of a Single, Converged Regulator for Telecommunication and Broadcasting Services in Tajikistan. http://www.osce.org/programme-office-in-dushanbe/215401. Statistical Agency under the President of the Republic of Tajikistan (SA), Ministry of Healthand I. C. F. International. 2013. Tajikistan Demographic and Health Survey 2012. http://dhsprogram.com/publications/publication-FR279-DHS-Final-Reports.cfm. World Bank. 2015a. Open Data Readiness Assessment Tajikistan. http://ispa.tj/wp-content/uploads/2015/09/En_ODRATajikistan_20151.pdf. ———. 2015b. Tajikistan–Public Financial Management Modernization Project. http://documents.worldbank.org/curated/en/490861467987889216/Tajikistan-Public-Financial-Management-Modernization-Project. The Casa-1000 hydroelectric energy transmission project (http://www.casa-1000.org/) is intended to include fibre deployment. Data obtained from local Kyrgyz experts. New data about the IXP and peering is likely to be forthcoming in 2018. Extracted from Facebook Ad Engine. Local Kyrgyz experts indicate that the issue of local content in Kyrgyz is a barrier to uptake. http://www3.weforum.org/docs/WEFUSA_DigitalInfrastructure_Report2015.pdf: “Research also shows that the three main reasons for not adopting the Internet: a perceived lack of need (mostly because of a lack of local-language content), followed by a lack of skills, and, as a distant third, affordability”. Catherine Putz. 2016. 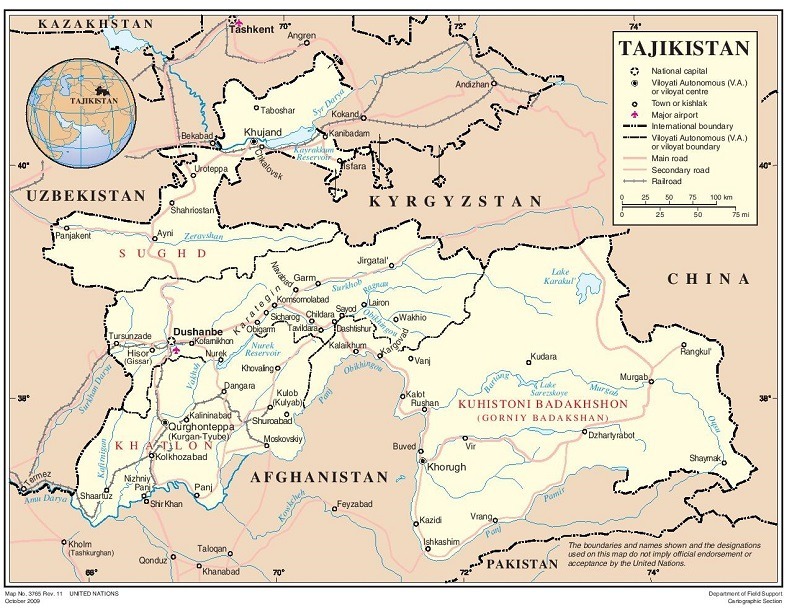 “Tajikistan: The Eurasian Economic Union’s Next Member?” The Diplomat, 19 July. http://thediplomat.com/2016/07/tajikistan-the-eurasian-economic-unions-next-member/. “Observatory of Economic Complexity – Tajikistan” at: http://atlas.media.mit.edu/en/profile/country/tjk/. Tajik lower house votes to declare President Rakhmon ‘Leader of Nation’”. Reuters, 9 December 2015. http://www.reuters.com/article/ustajikistan-president/tajik-lower-house-votes-to-declare-president-rakhmon-leader-of-nation-idUSKBN0TS1PE20151209. Single Window project team: http://demo.dhc3.intrasoft-intl.com/intrasoft/e-customs/tjsw/project-team. See “Single Window Information System in Tajikistan” at: http://www.carecprogram.org/uploads/events/2016/25-CBM-SubregionalWorkshop/Presentations/Session%207%20-%20Single%20Window-TAJ.pdf. “Customs Modernization and the Development of the Single Window (SW) facility for export/import and transit procedures” (undated). https://www.oecd.org/aidfortrade/casestories/CaseStory2015_37_Tajikistan_TradePolicies.pdf. Crown Agents (November 2016), “Tajikistan single window working group meets in Dushanbe”. http://www.crownagents.com/news-andknow-how/news-archive/article/2016/11/16/tajikistan-single-window-working-group-meets. The Internet Society has recently produced published an in-depth assessment of the Internet ecosystem in Tajikistan. This report was used in the preparation of this case study (Internet Society, 2017). https://www.internetsociety.org/wp-content/uploads/2017/08/ISOCTajikistan-IXP-assessment.pdf. Telia. 2012. “Background to Tcell and Telecommunications in Tajikistan.” News, 16 August. http://www.teliacompany.com/en/news/newsarticles/2012/background-to-tcell-and-telecommunications-in-tajikistan/. In contrast to the lack of official statistics, a study conducted by a civil society organization provides a comprehensive sector overview (Kosimov, 2012). Veon. 2017. Form 20-F. https://www.sec.gov/Archives/edgar/data/1468091/000119312517107561/d318647d20f.htm. “IFC Invests in Tcell to Expand Access to Mobile Services in Tajikistan.” News, 23 July 2014. https://ifcext.ifc.org/ifcext/pressroom/IFCPressRoom.nsf/0/628A9FCCFE01BBED85257D1E004DA8E4. Open Net Initiative. 2010. Tajikistan. https://opennet.net/research/profiles/tajikistan. World Bank. 2017. “Listening to Tajikistan Survey.” http://pubdocs.worldbank.org/en/780131503481833214/1-Survey-2pager-Eng.pdf. Website ranking from https://www.alexa.com/topsites/countries/TJ. Facebook users from extractions of the Facebook Ads Manager in 2011 and 2017. This problem is shared with the 30% of Tajiks who speak Uzbek—the language is similar to Turkish, but written in a different script. “Tajikistan bans cell phones from schools.” Reuters, 11 March 2009. http://www.reuters.com/article/us-tajikistan-mobiles/tajikistanbans-cell-phones-from-schools-idUSTRE5294P420090311. World Bank. 2011. Delegate Briefing Book. http://siteresources.worldbank.org/INFORMATIONANDCOMMUNICATIONANDTECHNOLOGIES/Resources/WBSSETF_MOLDOVA.pdf. Tajikistan appears to have committed to publish a paper on pro-competitive regulatory principles (something many WTO members have not done), make licensing and interconnection information public, and introduce a dispute resolution mechanism. Vergano and McKinnon, 2013. Business Guide on Tajikistan’s WTO Accession Commitments. p. 46., http://wto.tj/upload/Docs/ITC-Business%20Guide%20on%20WTO-Eng-Final-Dec%202013.pdf. “Tajik Authorities Seek Tighter Control Over Internet Traffic.” RFE/RL’s Tajik Service, 1 January 2016. https://www.rferl.org/a/tajikistan-internet-control-new-nexus/27511665.html. Telia. 2017. “Tcell Appeals Illegal Tax Claim in Tajikistan.” News, 17 January. http://www.teliacompany.com/en/news/news-articles/2017/Tcell-appeals-illegal-tax-claim-in-Tajikistan/.